eHam > eHam Forums > Elmers > Antenna splitter? Hi, I have several receivers and one transceiver next to me. I like to jump around from my antique SX28 to the Drake SW2 and a couple portables to compare. I have a 4 way Alpha Delta switch, but I realized the transceiver is really the only thing I need to isolate, so can I combine the other receivers through a splitter or just make my own? That way I could just turn up/down the volume of each radio to compare and not also have to crank around the switch all the time. If so, then why is this 2:1 splitter/combiner so costly? If you don't want to make one : mini-circuits are a much more professional source and better priced. Thanks I'll check that out. But what circuit is needed, why not just share the antenna? Just connecting two RXs will always work to some degree - but less than optimally as impedance is no longer matched giving weaker signals and there are possible interactions between the receivers. Wow THAT is GREAT information, just what I was looking for! Explains WHY a splitter is needed to share an antenna, and WHAT comprises a proper splitter, and HOW to build (or buy surplus) a splitter. Thank you a million I saved the PDF! 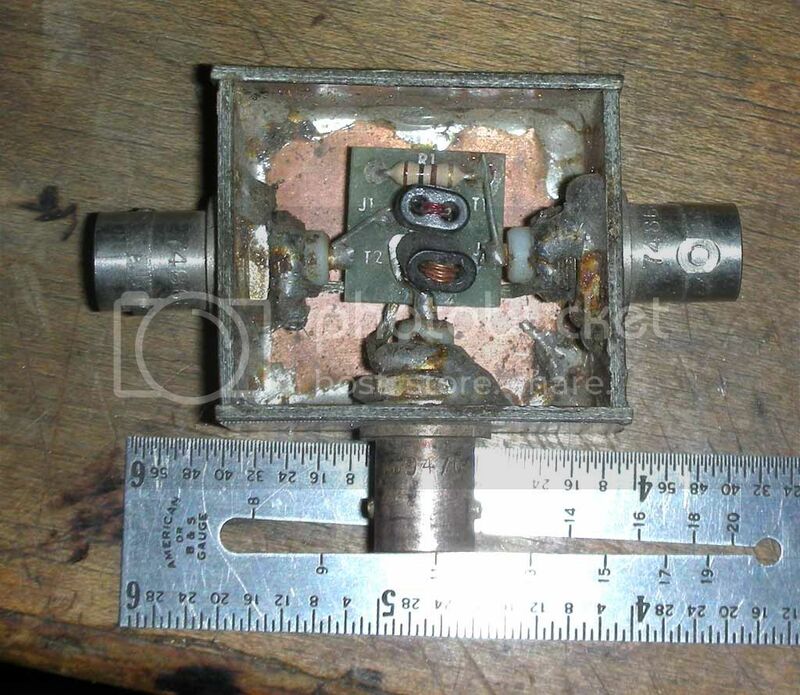 Here's another one, I use it for HF, I think it will work up through the FM band. the cores are Amadon 43-2402. T1 is bifilar, twist a pair of #28 enameled together about 1T/inch. T2 us just 2 turns-tap-6 turns. You can mount it on a small vector board and in a Pamona box with BNC connectors on it. I've used binocular cores I found laying around and it still works. Good isolation too. You should also be aware that there are resistive splitters out on the market. I don't recommend them as the resistive loss is 3 dB instead of lossless in a Hybrid splitter. Resistive power dividers are easy to understand, can be made very compact, and are naturally wideband, working down to zero frequency (DC). The two-way resistive splitter suffers 10xlog(1/2) or 3.0103 dB of real resistive loss. 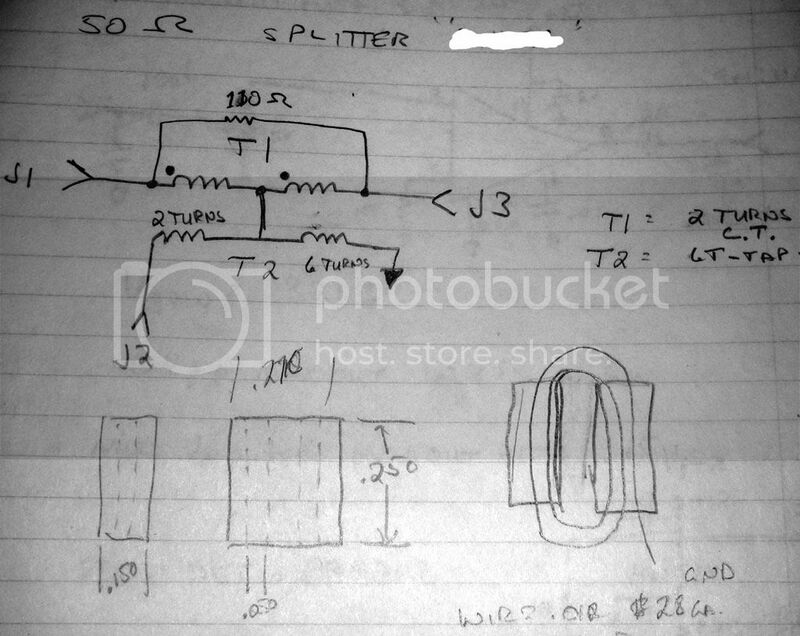 Accounting for 3.0103 dB real loss and 3.0103 dB power split, the net power transfer loss you will observe from input to one of two outputs is 6.0206 dB for a two-way resistive splitter, so they are often called 6 dB splitters. Resistive splitters also have next to nil port to port isolation. That one I showed will work through HF into VHF, around 30db port to port isolation, and if you choose the right core, it will go into UHF at the loss of HF. I reverse engineered it from a commercial one I had around, but I was guessing at the core material. The 75 ohm ones in the old TV antenna preamps are pretty much the same, but I think they use a higher freq core for VHF/UHF. Absolutely agreed. They are useful in wide band applications. Amplified devices are also called distribution amplifiers or receiver multicouplers. Simple devices will have splitter losses (3 dB for every split) so if you have four receivers the loss will be 6 dB as the same signal is then split across four different devices (every 3 dB is a doubling or halving). Insertion losses (due to circuit imperfections), impedance mismatches and receiver interactions. Active devices like distribution amplifiers/ multicouplers provide gain to compensate for the splitter losses and potentially provide some pre-amp gain. The trade-off is that you are also going to have a noise factor of the amplifier that gets added with the signal. You should also be aware that there are resistive splitters out on the market. I don't recommend them as the resistive loss is 3 dB instead of lossless in a Hybrid splitter. Just for the record, a hybrid splitter (passive device) is not exactly lossless. Splitting the signal between two receivers results in an approximate 3 dB reduction in the signal going to each receiver. Clifton Laboratories makes a nice little hybrid splitter (http://www.cliftonlaboratories.com/z10050a_3_db_hybrid.htm) with something like 30 dB of port isolation. I've assembled a couple of these and they work very well. Some transceivers with two receivers (Tentec Orion II for example) use a hybrid splitter and when you activate the second receiver on the same antenna as the first, you'll see a 3 dB reduction in signal. I've never seen a case where that made any difference in the ability to receive a weak signal on the HF bands. $5 is pretty good. I bet mine will do the same as far as response. They were used in some HF multiplexed receiver splitters. Don't need no stinkin' caps either. Being a cheapskate, I put mine in some double sided board. Just for fun I measured the 3db points (where it shows 3db loss in to out) on the splitter I have, 2 to over 200MHz; the port to port isolation is >30db from 4 to 170MHz and >20db up to 370MHz but by then the in to out loss is gone to who knows where, I didn't measure it. I'd say that's acceptable for an HF splitter. It could probably be made to work better lower and higher with the right core.